Over 70, active hiker and paddler (canoe). My husband and I live in the mountains of North Carolina (USA) but travel travel extensively in our travel trailer. We hike, canoe, and enjoy scenic drives and historical sites. We are retired and are in our 70's. We are experienced paddlers and trail guides. We have in-dept knowledge about the Florida Panhandle, Western North Carolina, and Eastern Tennessee. I write outdoor recreational guidebooks. Hard to find a place we don't like to camp. 2008 Crossroads, Sunset Trail, 22' Travel Trailer. we stayed at their location in Alabama last January. Very quiet & private space. Great hosts to accommodate us with water & electric, even shower in the cottage/shed beside the campsite. Thanks so much for a good first boondockers stay! We had the privilege of being the first Boondockers at this location. 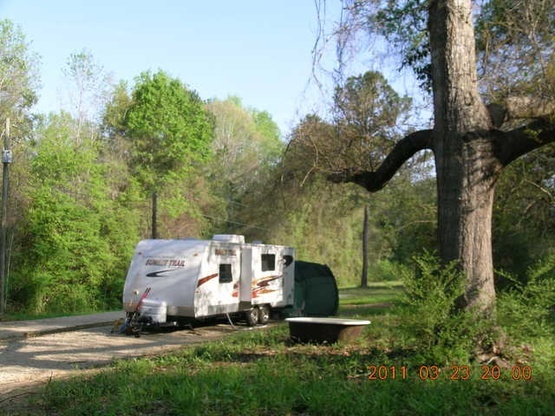 A hidden gem, but close to the city of Dothan and all the conveniences you could ask for, including the biggest Camping World I've ever seen. Beautiful piece of ground back off the road but, as always, it's the people you meet that make it special, and Lizzie and Butch are no exception. Very warm and welcoming. Highly recommended.